I was absolutely that stereotypical teenager with stars in my eyes who had heard in passing of a school in New York named Juilliard, and I dreamed of going there knowing little else about the school besides its reputation. I had been playing the piano for three years, and I was hardly at the level most of my future peers were at that time. Sure, what I didn’t have in technical ability I made up in passion, but at that point it was still mostly passion. I remember walking up the stairs from the subway station at 66th Street, turning around, and for the first time, seeing the glistening silver lettering on the side of the white building where I hoped to spend four years of my life. It took my breath away. But after going inside, taking a tour and asking some questions, I stood with my parents on the steps of Avery Fisher Hall with my heart in the pit of my stomach. Before going into the school, it had all been a beautiful, perfect fantasy. But once I was given the Viewbook, the application forms, the lengthy list of audition requirements, and the prohibitive admissions statistics, I was completely and painfully aware of what it would take for someone like me to even be taken seriously by a school of that status. It was much more than I was capable of, to be sure. I didn’t even know where to begin, what questions to ask. I knew from that moment that I was fighting a losing battle. And I knew that I had no other choice but to fight it. Later that day, we happened to be in a jewelry store in SoHo. I bought a plain, silver ring, put the ring on my finger, and promised myself that until I moved to New York and attended Juilliard, I would not take it off. I took it off five years later, the day I moved into my dorm room at Juilliard. I’m not saying it was inevitable. In fact, it was the opposite of that – it only got harder as the years passed. When the time came, I didn’t even want to put in an application because I knew that receiving a rejection letter would crush me beyond repair – it was my father who knew how hard I had worked and literally forced me to at least give it a shot. I knew I had put everything on the line for a dream that was anything but a guarantee. Though I worked tirelessly, I was not a prodigy. I was still just a regular kid who really loved music, and by the time I was a senior in high school, I was unequivocally aware of that fact. But the ring remained on my finger, always in my field of vision. I tried to forget it was there – it glared back at me. I knew that taking it off would mean voluntarily conceding. And perhaps it was ultimately my unwillingness to admit defeat that moved me forward, one millimeter at a time. I’m not saying it was easy after that either. Many times, sitting alone in a windowless blue-curtained practice room late at night, hungry and tired with a blank page in front of me and no thoughts left in my head, I asked myself if it had really been worth the promise I had made so long ago, and if it was really fair to hold myself to a challenge I didn’t fully understand when I signed up for it. Ten years after I moved to New York, I still don’t know the answers to those questions. But what I do know is this: the act of making that pact and seeing it through to fruition, whatever the cost, gave me the little extra courage I needed to face every other obstacle from that point forward. From the time I started composing, I was keenly aware that, at least visually speaking, I was the goose in a bunch of ducks. Though these days, the community of western classical musicians is much more varied than it has been traditionally, one thing is for sure: there definitely aren’t many Indian women composers. Almost without fail, people meeting me for the first time would have the same response: Did you grow up studying Indian classical music? You should really write something combining Indian music with western classical music! The truth is, I felt terribly embarrassed. I really didn’t know anything about Indian classical music. I had barely ever heard it. My mother, who comes from a part of India that had been colonized by Portugal, listened to only western classical music growing up – so that was what I knew. I had worked very hard to be the best western classical musician I could be. But I still looked Indian, and I somehow felt that people were disappointed that I didn’t fit into their image of me. But then one day I met a Hindustani singer. Then a few years later, I met a Carnatic singer. And gradually, I realized that it wasn’t as much the dissociated sounds of Indian classical music that were interesting to me as it was getting to know the people who made those sounds. I recognized the culture that surrounded the music as the culture that existed in my family, but that was not reflected in my professional life. As I began to have opportunities to work with Indian musicians, to let them lead me in the way that was natural for them, I realized that their aesthetic, their values, their way of being felt more natural to me than those elements in the music I had grown up studying. And that is how I grew to love the music. A few months after returning from my trip, I was browsing in a store that carried Indian imports, and I found a ring that reminded me of one I had seen in Jaipur and regretted not buying. I tried it on, and it fit perfectly. As it turned out, the ring was from Jaipur, and the woman at the store even let me bargain her down a little, which at that point felt mostly sentimental. 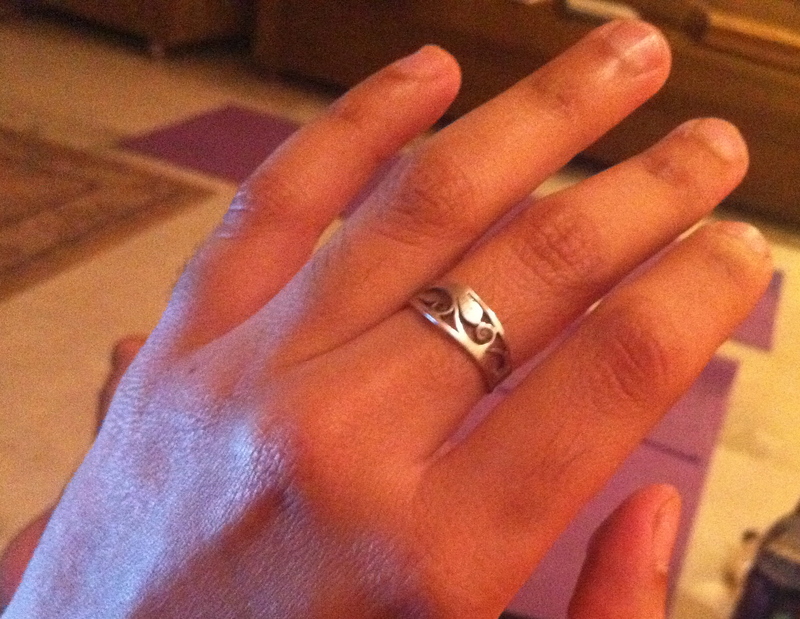 Once again, I put the ring on my finger, and vowed that I would find a way back to India through music. This time around, though, the route was much more circuitous. I didn’t spend every single day worrying about how I would get back to India. My work was moving in many different directions that I truly enjoyed: I studied the violin intensively, I composed a number of pieces for choir, I taught both privately and at Manhattan School of Music and had many incredible and inspiring students who taught me volumes, I studied with some wonderful composers of western music who also taught me volumes. Those things definitely took the front seat in my professional life for many years, and they made me very happy. I met a number of Indian musicians, sometimes just socially and other times to collaborate. Sometimes there would even be a cup of pakka Hindustani masala chai, and some homemade idlis. I left these meetings feeling, on one hand, wildly impassioned and filled with a sense of possibility, and on the other hand, strangely homesick for a country in which I had never lived. Though I didn’t have the knowledge or means to do much about it at the time, the inkling of something was always there. Two times during those five years, I had actually been asked to write a piece for eastern and western instruments, and one organization even offered to take me with them to India. In the end, both projects fell through, but my ideas remained with me. Three years ago, I had applied to the Yale School of Music, and had been waiting to hear if I had gotten an audition. The morning of the decision deadline arrived, and I still hadn’t heard anything. I was trying to fight the impending disappointment, and the first thing I thought to do was start a Fulbright application. Ultimately, there had just been a delay with the composition department’s decisions, I auditioned, was accepted, completely forgot about that moment of uncertainty. 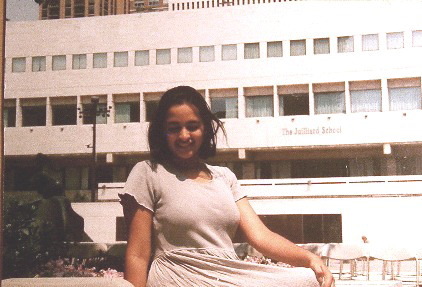 Though applying for the Fulbright was hardly more certain than applying to Juilliard, the process was a different one. On one hand, the application itself was much more daunting and multi-faceted than applications to the schools I attended. I had a checklist of over a hundred items that seemed to multiply daily, I made random calls over skype at odd hours of the night and had regular nightmares for weeks. But on the other hand, it was the first application I had ever submitted that didn’t require me to mold myself even a little bit into another, more desirable version of me. As I wrote my personal statement, I realized I was able to share things that had never mattered on any other application I had submitted. The fact that I was a first generation Indian-American meant something. The fact that I grew up speaking Gujarati wasn’t just trivia – it was, for once, more pertinent than my knowledge of Italian and Spanish. I wasn’t just Indian anymore – I was half Goan and half Surathi, which among Indians is a rather rare and curious lineage. Even my labor of love, Yale’s Hindi a cappella group for which I had been arranging mashups of Bollywood songs and American pop music, was something I could mention unabashedly on this application. Though it was mostly a novelty in my regular circles, it did in a certain sense say something about my ability to ‘promote mutual understanding’ through music, as per Fulbright’s mission. My ring from Jaipur is substantially worse for the wear. I haven’t taken it off since 2006 except for the one time a few years ago that a piece of the jhali work bent and started poking into my finger. Having witnessed a few holidays in India already, I know that many rituals and celebrations end in water or fire. Durga is immersed in the river. Ravana goes up in flames. In a country with so many people and very little place to store things, it makes sense that this would be integral in the rituals and customs of holidays. So I think it’s fitting to follow suit. I haven’t seen the Ganges yet, but when I do, I will give her my ring. This entry was posted in Uncategorized and tagged identity, music, musings, western classical music. Bookmark the permalink. Your writing is wonderful! I really enjoy reading about your experiences. I hope that you will publish a memoir one of these days! I am enjoying my class in musicianship at Juilliard and learning in a way that finally makes sense to me. I don’t know if I will ever play again, or get to India, but I am going to try.